Floormat.com has posted an updated version of its sales policy on its website. The company has changed some of the Terms & Conditions of sale and reviewed its entire Return Policy. According to Floormat.com, the updated sales policy is meant to enhance the company's business operations. Floormat.com is inviting all its customers to visit its website to view its updated Sales Policy. The company has reviewed various sections of its sales policy and all customers are expected to acquaint themselves with the changes. Following the review, Floormat.com has posted the updated version of its sales policy on its website. To view the company's new Return Policy, customers can click on the "Returns" link at the bottom of the homepage. Similarly, the updated terms and conditions are under the "Terms & Conditions" link and more changes are available in the "FAQ" section. The updated Return Policy advises any customer who has a problem to contact Floormat.com via e-mail, phone, or fax ASAP, and to describe the problem in detail. According to the company's website, return of any product requires a Return Goods Authorization (RGA) number, and approval in advance of the return. Incidentally, no products will be accepted for return without the RGA number. Also, the return of stock items may be subject to a 25% restocking fee and the customer is responsible for freight charges with proper packaging. Another notable point is that custom and non-stock items are not eligible for return. And last but not least, if the item has a manufacturing defect or some other mistake, please contact Floormat.com with details of the problem; the company will try to resolve it. All returns must be made within 14 days of receipt of goods. Floormat.com is the premier expert in floor mat, anti-slip tape and tread, noise and vibration, and other specialty product solutions for business and residential applications. Founded nearly 70 years ago in 1951 in Etna, Ohio, this matting company has produces its own matting products and also distributes for some of the leading mat manufacturers in the United States. 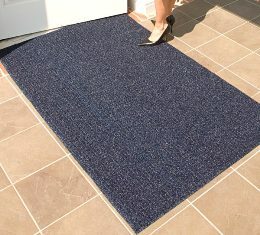 Floormat.com passionately supplies entryway mats, indoor & outdoor mats, anti-fatigue mats, anti-slip mats, heated mats, vinyl loop mats, logo mats, anti-slip tape and treads, safety tapes, cleaners, specialty products etc for home, office, multi-business brands, and global industries. See https://www.floormat.com/medical-floor-mats-explained/ for information concerning mats for the healthcare industry.